Pumpkin truffles, pumpkin pie, pumpkin rice crispy treats---whaddaya say we round out the fall lineup with some ice cream? 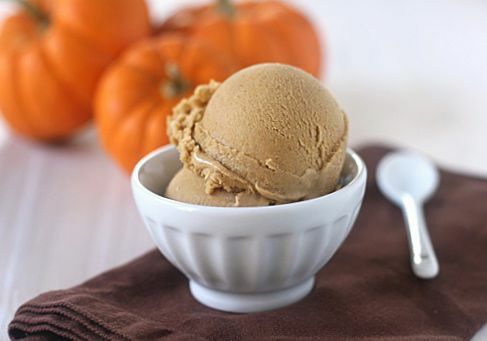 Not just any old ice cream, but pumpkin pie ice cream, a dessert lover's dream. The original recipe called for heavy cream, but I took it easy on the waistline and used half-and-half. I increased the cinnamon a tad and added some ground cloves because that's what I like in my pumpkin pie. The tablespoon of bourbon keeps the custard from freezing rock hard and lends a little spike, but it certainly can be omitted. This frozen goodness has all the deliciously wonderful qualities of a piece of pumpkin pie with a dollop of whipped cream on top in each creamy spoonful. And you'll save calories and carbs because there is no crust☺! In a large saucepan over medium heat, combine 1 1/2 cups of the half-and-half and 1/2 cup of the brown sugar. Cook just until bubbles form around the edges of the pan, about 5 minutes. Meanwhile, in a medium bowl combine the yolks, cinnamon, ginger, cloves, salt, the remaining 1/2 cup of half-and-half, and the remaining 1/4 cup brown sugar. Whisk until smooth and the sugar begins to dissolve. Remove the cream from the heat. Gradually whisk the hot cream mixture into the egg mixture until smooth. Pour the entire mixture back into to the saucepan and cook over medium heat, stirring constantly and keeping the custard at a low simmer until it is thick enough to coat the back of a spoon, about 4-6 minutes. (Do not allow the custard to boil.) Strain the custard through a fine-mesh sieve into a bowl. Place the bowl in a larger bowl partially filled with ice water, stirring occasionally until cool. Whisk the pumpkin, vanilla, and bourbon into the custard until smooth. Place a piece of plastic wrap directly on the surface of the custard to prevent a skin from forming. Refrigerate until completely chilled, at least 3 hours or overnight. Transfer the custard to an ice cream maker and freeze according to the manufacturer's instructions. Transfer the ice cream to a freezer-safe container and freeze until firm, at least 3 hours or up to three days. Enjoy! This looks delicious!! Will be trying this weekend. Oh! It looks yummy! I just wish for a fast recovery from my dental implant new york operation, so that I could try your pumpkin pie ice cream.